A Dubuque-based company that operates the Diamond Jo casinos in Dubuque and Worth County offered a proposal today that would link them with the Prairie Meadows horse track and casino. Penninsula Gaming C.E.O., Brent Stevens, told reporters this afternoon they want to invest millions in a second Des Moines-area casino south of the airport. Stevens says they would put $150-million into Des Moines and Polk County to "help allow Prairie Meadows and all of its stakeholders to retain control of gaming in central Iowa." He says the new facility would contribute a percentage of its revenues to the county as it’s non-licensee sponsor. Recent studies conducted for the state Racing and Gaming Commission showed there is more revenue potential in central Iowa, and Stevens says a second casino called "Prairie Meadows South" would meet that market demand. Prairie Meadows currently brings in around $41-million in revenue for the county — and $44.5 million in taxes for the state. Stevens says the goal is to bring in more revenue for the stakeholders of Prairie Meadows and the current casino will incur no risk. Stevens says adding more opportunities for gamblers expands the market and was used successfully in Dubuque. Stevens says there were no other economic drivers when they expanded the market in Dubuque, and he says it was not just a matter of adding capital, but adding the right kind of capital and product to draw more customers. He says the plan increased the revenue to the no-profit license holder in Dubuque by 50%, and increased Peninsula’s profits in Dubuque by 40%. Stevens says Prairie Meadows South would include quarter horse racing, a rodeo and show area for horses, an entertainment complex and a hotel. The Racing and Gaming Commission study showed a second casino in Des Moines would take some $50-million in revenue from Prairie Meadows and also some $15-million from the Terrible’s Casino in Osceola. The owners of Terrible’s are in the midst of bankruptcy and Stevens was asked if the Osceola casino might also be helped to stay in business as part of a second license for Des Moines. Stevens says they are negotiating right now with Prairie Meadows for a "Polk County centric" opportunity, and as they go forward there might be other variables to come out, but they haven’t addressed those. Stevens says the current casino should take this option before someone else comes into the market. Stevens says: "Expanded gaming is inevitable in central Iowa, period. Really the question becomes who? 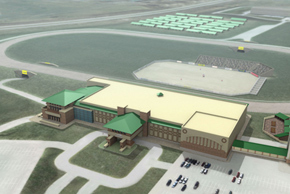 This is a great opportunity, it’s a great moment for Prairie Meadows." Stevens may have some work to do to sell the idea to the Polk County Board of Supervisors. He made a presentation to the board this morning and afterward Supervisor Tom Hockensmith said he finds no public support for a second racetrack and casino. "I’ve had numerous discussions with constituents in my district since this whole issue was brought forward, and quite frankly have not found one single constituent in my district that supports an additional casino in Polk County, not one," Hockensmith says. Hockensmith represents the Altoona area where the original Prairie Meadows is located. Supervisor John Mauro was not swayed by the the Peninsula claim a second casino is a "no risk" proposition for the county. "I happen to have been here in the 90s when we had a horse track out there and we were guaranteed it was going to succeed and we ended up closing it down and good things happened to us and we got this casino going. We have a lot of commitments to this community and we’ve got to protect this community and we got to protect this community," Mauro says. Wild Rose Entertainment, headed by West Des Moines businessman Gary Kirke, is also interested in developing a Polk County casino. The Racing and Gaming Commission is accepting applications for new casino licenses through October 1st.